Yolanda Franklin and Rhianna Basore in “This Wide Night” at ion theatre. Loneliness and loss. Dejection, rejection. Anger and bitterness. Untrusting and unloved. 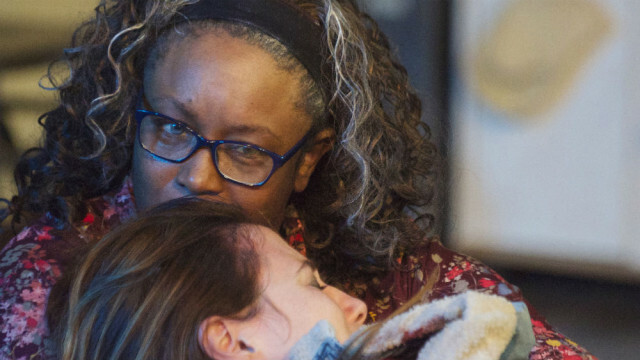 These emotions pulsate like an undertone through the searing slice of post-prison life that is “This Wide Night,” by award-winning English playwright Chloë Moss, at ion theatre. It’s a two-hander tour de force, as a pair of former cellmates come together and apart, trying to forge a new life for themselves. On a rainy evening, Lorraine (Yolanda Franklin) appears at the door of a marvelously disheveled London flat (scenic design by director Claudio Raygoza). Marie (Rhianna Basore) crouches behind a chair when she hears the knock. Cautiously, she admits Lorraine, and thus begins a hesitant 90-minute pas de deux of reminiscence and concealment, intimacy and estrangement, argument and reconciliation. The dialogue is sparse, often monosyllabic. There are long pauses. This is hopelessness in real-time, slow and endless. There’s little backstory and no resolution. Based on her work with female prisoners, Moss’ gritty, gut-wrenching piece isn’t for the faint of heart. But the curious and intrepid theatergoer will be well rewarded, with two outstanding performances, expertly directed. Raygoza, a master at plumbing the dark depths of the soul, knows just how to give a play like this room to breathe, as suffocating as the setup may be. His exquisite, potently-accented actors — Basore as wary, wounded Marie, and Franklin as heartbroken and broken Lorraine — circle each other like still-caged animals, reluctant to reveal real feelings, or confront the truth of their desperate lives. Raygoza’s set is a hothouse of dissolution and disarray. It never gets cleaned up. The cigarette butts accumulate in the ashtray; the pizza box remains splayed on the floor. And though we don’t know what’s ahead (or even what got one of them incarcerated), we can just imagine the bleak future that awaits them. This may be England, but the situation isn’t so different here. The system virtually abandons the newly released, who are unprepared for making their way on their own. There’s nothing ‘wide’ in this claustrophobic drama, except maybe the expanse of time that lies before these hapless perpetrators-turned-victims. Once again, ion shines a piercing light on a dim corner of society, a tightly focused beam that deeply penetrates. “This Wide Night” has been extended through Oct. 11, at ion theatre, 3704 6th Ave., on the edge of Hillcrest. Performances are Thursday-Saturday at 8 p.m.; Saturday at 4 p.m.